Devil May Cry 5 was finally confirmed back at E3, putting an end to endless speculation about a proper sequel, but we haven’t seen much since. Apparently we won’t have to wait much longer for more info, as Capcom aims to have the game playable at Gamescom next month, and will be sharing new info then. Gamescom 2018 runs August 21-25, but the studio has seen fit to drop some new info now, as well. The developers are shooting for photorealism, but aren’t sacrificing gameplay speed – they’ve got a 60fps target. Presumably that number is meant for consoles, but it does mean we should expect at least the same on PC. Don’t miss any of the best PC games. More notably, Capcom is trying to balance quality animation with playability. Inputs no longer skip animations, as that would distract from the game’s visual quality. It sounds like inputs are still being registered with each button press, so we’re not likely seeing DMC turn to Dark Souls, but the folks at Capcom say they’ve struggled to balance visual quality with responsiveness. Other details from the Famitsu interview – translated by Siliconera – include some details on the music system, which will progress between melodies as you hit certain combo targets. Though that also means you might be stuck in the basic song if your skills aren’t up to snuff. 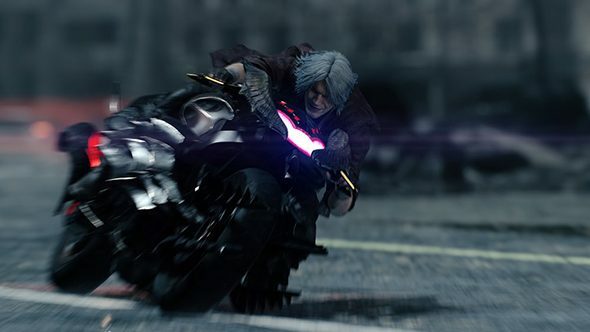 Devil May Cry 5 is set to launch spring 2019, bringing us a somewhat haggard Dante alongside our protagonist Nero. I can only hope this return to form allows us the chance to forgive, forget, and recognize that Ninja Theory’s reimagined DmC was actually pretty good divorced from the context of the series.